If you've looked at my schematics there's a couple of things common to both the vertical E-field and H-field loop amps. Namely the arrangement of antenna input protection, high impedance matching, high gain amplification, LC low pass filtering , remote gain control and balanced output for signal and power supply. A lot of experimentation went into developing these amplifiers even though little of it is original work. Some was chosen because it's obviously appropriate and basically sound design. Some is modified to improve the original design and overall the components are assembled to provide better and more flexible performance than any of the original designs offered. All of the components are available at this time from Mouser Electronics http://www.mouser.com/ as well as others. The electronic volume control chip is offered by JDR Microdevices at a good price. 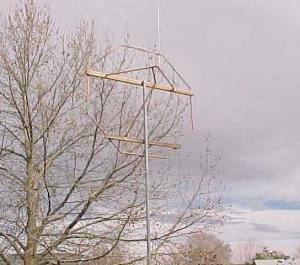 http://www.jdr.com/ Including remote gain control solved a lot of problems in system performance especially when you consider erecting a heavy antenna array. Taking it down several times to get levels correct for best signal to noise ratio is tedious at best. Putting up the array and setting level remotely from the comfort of a vehicle makes a lot more sense. The chip used handles this task with ease and requires only a remotely located 50K potentiometer. Under differing signal conditions this feature becomes very handy. The choice of JFET for the vertical amplifier was arrived at by testing virtually all of the available transistors. It has high impedance input and gain, is configured for good filtering characteristics for RF signals above 10khz and gate protection via the back to back zeners. The LC low pass filtering is almost exactly taken from the BBB4 receiver by Steve McGreevy. Using the MC3340P chip for remote gain adds a -85db to +6db control range and a lot of convenience. The output stage, although very simple, allows the signal obtained to be sent down cable in balanced fashion with good common mode rejection of hum and noise and an easy way to feed operating power to the amplifier. The U310 is available from RF parts company http://www.rfparts.com/ and they have a $25 minimum order policy. Other devices will certainly work. MPF102, 2N3819 and 2N5486 are good choices just note the different pinouts for each transistor. 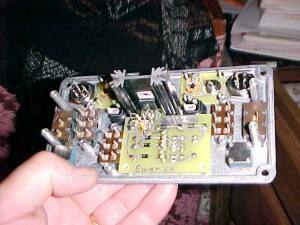 An antenna and mount for this type of amplifier is very simple and many choices are available. The choice of loop amplifier can take several forms. 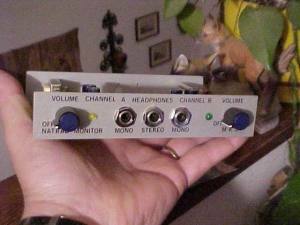 The modified transistor version based on Renato Romero's loop amp as modified with LC low pass filtering and remote gain control is very good and uses commonly available transistors. IC1 = MC3340 electronic gain control IC -85db to +6dB range. 50k to gnd remote pot. The AD620 version using the step-up transformer input matching and zener protection has significantly more gain and slightly better noise performance along with the filtering, gain control and balanced output. JDR Microdevices can provide this instrumentation amplifier in single lot quantity for around $8 each. The choice of antenna configuration and size is about endless. Will Payne's Octoloop is one of the best I've used and is very easy to construct. Information on how to build one is available at http://www.lwca.org/library/articles/ywk/octoloop.htm . Matching the loop to the AD620 is best performed using a step-up transformer in balanced fashion on input and output. Operating the amp on a single 12 volt mobile supply is accomplished easily by biasing the centertap to VCC/2 and the output can also be connected to this voltage with pin 5 or it can be connected to ground for a zero output voltage. Some suppression of rectified RF voltage is obtained by connecting 150 pf capacitors from both inputs to the gain control pins. Much more information on handling the AD620 is available at http://www.analog.com/adibin/quick_search . Uses 4 conductor flat phone line and RJ11 plugs and jacks between antenna amps and box. Provides +12VDC and ground return plus 600 Ohm balanced signal input and DC isolated line and MIC level outputs for a stereo or mono recorders. 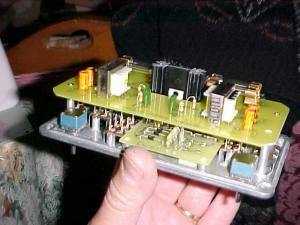 All gain and filtering provided by antenna amps. To run 2 antennas and remote gain controlled amps. New antenna amps have all gain and filters. 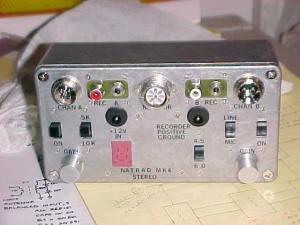 This box provides +12VDC and groud return plus the remote gain control and 600 Ohm balanced signal. The record outputs include line level 5 kOhm and mic level signals that are DC isolated from the vehicle system and the antenna amp. Resources: Renato Romero, Dave Oxnard at the workshop, ARRL, Analog Devices, Motorola, The Longwave Pages and Will Payne, Steve McGreevy, Mouser, JDR Microdevices, Radio Shack, RF Parts Co. and others.